I bought this skirt at a sample sale last year and have gotten so much wear out of it. I was surprised how much I loved this high-wasted maxi skirt, but it somehow elongates me and creates the illusion of long legs which is something I definitely don’t have. I like pairing it with a bold colored top like red, but it always looks great with a simple black or white tee. 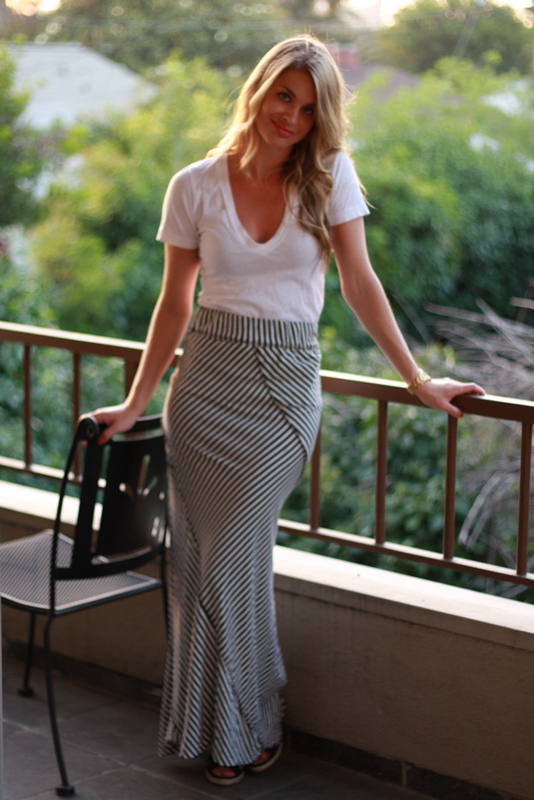 I would not mind having this striped maxi skirt 🙂 …..looking great Ash!! I LOVE that skirt. It definitely gives you legs for days. And I love that you paired it with a simple tee shirt. You have such great style. I love this entire outfit! The skirt is amazing on you! Pretty sure there is nothing better than a maxi…you look great! Dear you look absolutely gorgeous! the skirt is stunning and I like how you dressed it a bit down with a casual white Tee!